A limited number of non-patent literature files on ProQuest Dialog are now supported in BizInt Smart Charts for Patents. 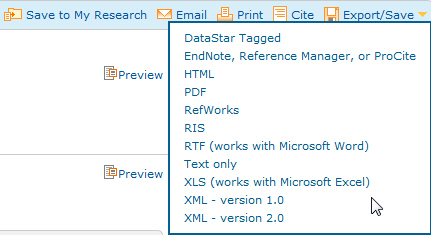 Starting in version 4.0, use the "XML - version 2.0" export format for these sources. Starting in version 3.6.0, BizInt Smart Charts for Drug Pipelines includes support for some drug pipeline databases on ProQuest Dialog. Use the "XML - version 2.0" export format for these sources. Select the records you wish to export and hover the mouse over "Export/Save" (or use the "Download all results" button). Select the "XML" format from the options provided. On the Download results panel, select either "Brief Citation/Abstract" or "Citation/Abstract". Scroll down and press the Continue button. Save the XML file to your hard disk. Import file into BizInt Smart Charts using File|Import or by dragging the file and dropping it into BizInt Smart Charts.